If there’s one thing that Amsterdam is most known for, it might just be the flourishing tulip. Along with windmills and historic attractions, this bright and beautiful flower has become a colourful symbol of Amsterdam and the Dutch countryside. Though tulips are almost synonymous with Holland, these flowers actually originated in the Ottoman Empire and are mostly indigenous to parts of central Asia such as Iran, Pakistan and Turkey. Tulips began gaining popularity among the Dutch in 1593 thanks to a prominent botanist at the University of Leiden named Carolus Clusius, who introduced the tulip to the Dutch and they’ve embraced it as their own ever since. Indeed, tulips are so beloved and prized in this country that 17th century Holland went through what’s called a “tulip mania” craze in which some Dutch went as far as remortgaging their homes to get their hands on some of these precious flowers. Considered a symbol of luxury and status, some Dutch offered vast amounts of money for a single bulb. To capitalize on this “tulip mania,” tulip bulbs and their futures were traded on the local stock exchange as early as 1636 – with people selling their land, homes and possessions to invest in these flowering bulbs. Nowadays, of course, there’s no need for anyone to go broke or risk losing their homes to see or possess some of these vivid flowers. However, it’s worth noting that Holland still dominates the global tulip market, producing more than four billion bulbs each year. Here, you’ll find more than 30 hectares of flowers, seven million blooms and some 800 varieties of tulips each spring. Situated roughly 35 kilometres southwest of Amsterdam in the famous Flower Strip, the Keukenhof Gardens is easily reachable by car or public transport. Don’t miss your chance to see and walk through these gardens that burst with colour each spring – showing off nearly every shade of the rainbow. Keukenhof Gardens is generally open from late March to mid-May. Kids will be equally amazed with the treasure hunt, playground, onsite petting zoo and maze. For something truly out of the ordinary, make a quick visit just 25 kilometres southwest of Amsterdam to Aalsmeer for a tour of the world’s largest flower auction. Here, flowers from across the world – including places such as Colombia, Ecuador, Ethiopia, Kenya and other parts of Europe – are traded daily inside this immense 10.6 million square-foot building. In typical Dutch auction style, the price begins high and then counts down with bidders only getting a few seconds before the flowers are sold. 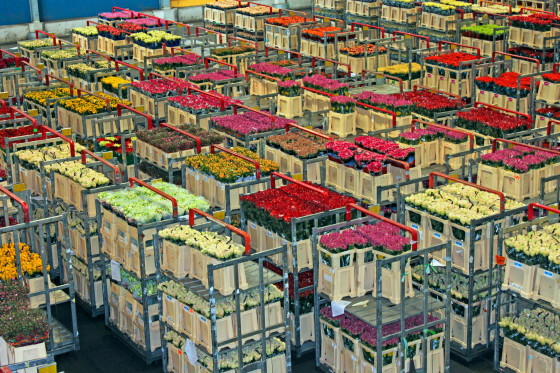 However, with the emergence of online trading, fewer rooms in this building are being used; and there’s some uncertainty as to how online trading will affect the future of Aalsmeer’s traditional flower auctions. For now, be sure to come early to check out all the action. Aalsmeer is open to the public only on certain days. For more information, click here. How exactly did the tulip make its way from Central Asia to Holland? Why did Carolus Clusius introduce this flower to the Dutch people? What are some of the impacts of tulip bulbs on Holland’s economy and growth? For the full history of Holland’s horticultural history, a visit to this unique museum is a must. Situated in the Jordaan district about two kilometres southwest of Amsterdam’s Centraal Station, the Amsterdam Tulip Museum is easy to reach by foot, bike, car or public transit. Since there can never be too many tulips, this annual event celebrates Holland’s national flower by ensuring it blooms across Amsterdam each spring. Throughout the month of April, some 400,000 bright (and sometimes rare) tulips can be seen at a variety of gardens, including those of some city buildings, museums and private residences. For a full list of participating locations, get your hands on a festival guide (available in early April). In Holland, this special January event is known as “Nationale Tulpendag” and is held in the heart of Amsterdam at Dam Square, which is blanketed with a spectacular garden of some 200,000 tulips for this one-day event. An annual tradition since 2012, this festival kicks off Holland’s upcoming tulip season. An added bonus? On the afternoon of this National Tulip Day, visitors to the Square are welcomed to pick the tulips for free.